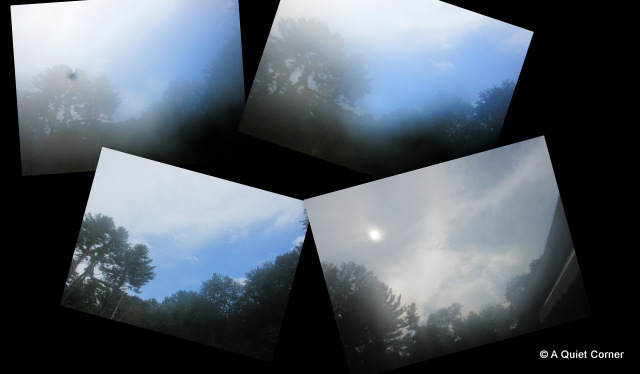 Realizing that I needed a sky shot for today, I stepped outside on the deck and took a few photos. After wiping the lens, what I got was the same in both the Eastern and Western sky. Looks like it might rain any minute! It has been so humid here too. And in the 90's. Ugh! I've stayed inside all afternoon. The heat and the humidity was the topic of the day here today. It was really bad but I would tell everyone I'll take this over freezing any day. Same here...no way to get around it with our cameras. I can see and feel that humidity! Great shots. Wow ~ That is very humid! But at the same time it creates an fairytale-like effect~ beautiful! Wow....wow....wow....wow that is a lot of humidity! Get the fans out. Turn on the air. Relax. Tomorrow will be another day. Great pictures, by the way. Made me feel like sweating. Oh yeah, girls don't sweat. ROFL! We sparkle!!!! !